Gaze into my crystal ball, originally uploaded by The Bacher Family. Isn't that what we always say, as photographers? Gaze into this glass circle, give us your best smile or soulful expression, and we will, in return, capture your essense on film or digital bits and bytes. 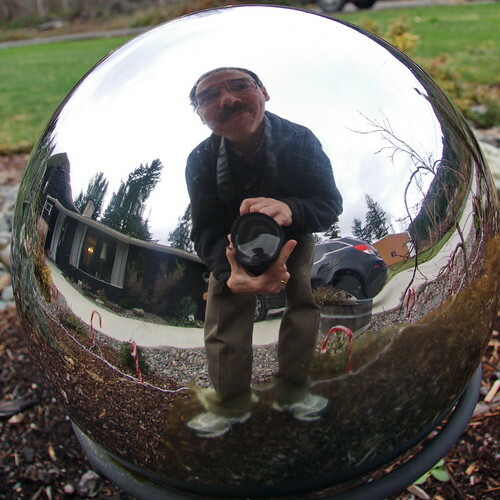 In this case, though, the crystal ball in question is an ornamental globe in the front landscaping of my wife's aunt and uncle near Glenoma, Washington. We were there for a Christmas party and were some of the first to arrive, so I amused myself by snapping self-portraits in the reflection. This one is my favorite. You could probably do all kinds of cool things if you polished the globe first, carefully arranged the background items, and waited for the perfect weather--wouldn't falling snow be interesting?--but even without those things it made for a fun photo exercise.